Migraines are painful, frustrating, and disruptive to daily life. For years, researchers have been trying to pinpoint the cause of these extremely uncomfortable headaches, and figure out how to relieve them. Researchers have struggled to find a one-size-fits-all cure for migraines because they are caused by such a wide variety of things and characterized by such a wide variety of symptoms. However, some homeopathic measures have recently surfaced to help relieve chronic migraine discomfort. One such measure is a daith piercing. To better understand what a daith piercing can do to relieve your migraine pain, it’s first important to understand what a migraine is and why it differs from other types of headaches. Typically migraine sufferers complain of sensitivity to light, smell, or sound as well. Migraines can make you nauseas, and at times can even lead to throwing up. Migraines are caused by vascular changes in the brain, which is part of what separates them from other forms of headaches. Migraines are often hereditary, and they happen most often to women. In fact, more than half of migraine sufferers are female, which doctors believe to be the result of links between migraines and hormones, although there is not a definite answer to why that is the case just yet. Researchers have been trying to determine the exact cause of migraines for years, but to no avail. Some migraine sufferers also have to be careful when they travel in order to not have a migraine triggered by changes in weather or altitude. With all of these different factors effecting migraines, it’s easy to see where doctors and researchers would have a hard time treating these headaches with traditional methods. Some migraine sufferers have found relief by using techniques that are considered outside of the realm of modern medicine such as acupuncture and acupressure. Let’s take a deeper look at what these therapies are and how they can help relieve migraine pain. What Are Acupressure And Acupuncture? One of the most commonly used techniques in Traditional Chinese Medicine (TCM), acupressure, and it’s sibling acupuncture, is used as a method to stimulate the body’s self-healing process and regulate the flow of Qi or vital energy. Acupressure has been used for more than 2000 years, and is still in use today. The longevity of its use says a lot about how well this technique works to relieve pain and anxiety, and help the body to heal. Acupressure points are organized across the body on a total of fourteen meridians. There are over 2000 points in total. Acupressure is administered by using deep, firm pressure to stimulate a given pressure point on the body, known as an acupoint. When acupressure is self-administered, you should relax and breathe deeply with your eyes closed. If someone is helping you massage these points, ensure that person is also relaxed. Where acupressure is a form of massage that treats the acupoints on the body, acupuncture stimulates these points through the use of needles. These needles are as thin as a single strand of hair, but the deeper connection with acupoints that they stimulate in the body allows for a stronger response than acupressure. If needles aren’t something you’re into, laser and electromagnetic acupuncture are also available in most modern offices. To date, needles are still seen as the most effective acupuncture method, and the best way to stimulate acupoints to start the body’s healing process, so keep that in mind before turning down the needles. Faithful TCM practitioners have used acupuncture and acupressure to relieve migraine pain for years. Unfortunately, most of this work has gone unstudied, so the stories of this type of pain relief working well are purely anecdotal. Anecdotal evidence often spurs studies, however, so we will likely see more on this soon. There are three specific acupoints that practitioners often use to relieve migraines; those are Shuaigu (GB 8), Taiyang (Extra 1), and Waiguan (SJ 5). The first two points listed here are located on the head, and the final point is located on the wrist. These points are best utilized together in order to fully relieve migraine pain. There is very little information out there about the benefits or drawbacks of using piercings as a form of acupuncture, or how piercings affect ongoing acupuncture treatments. However, the general view of the latter is that the pathways that energies in the body follow will change to move around a piercing once it’s healed. The question of the former can only be answered anecdotally, but recently there has been an increased interest in this evidence. It’s difficult for the medical community to study acupuncture, but more and more researchers are becoming intrigued enough to look into the subject further and at least study individual patients. Of the few studies that have been conducted, one in particular stands out. A study involving 175 participants, both male and female, split participants up into three randomized groups. Two of the three groups received non-acupuncture treatments that appeared similar to acupuncture, the third group received the real thing. The group that received acupuncture showed significantly lower levels of pain and pressure post-treatment, and even more impressive, most participants were much slower to relapse into pain or symptoms after up to a year after treatment. Although this is only one small study, the results are so significant that it has created a buzz in the larger medical community. More and more doctors are opening up to offering a mix of modern medicinal treatments and these Traditional Chinese Medical treatments to their patients. 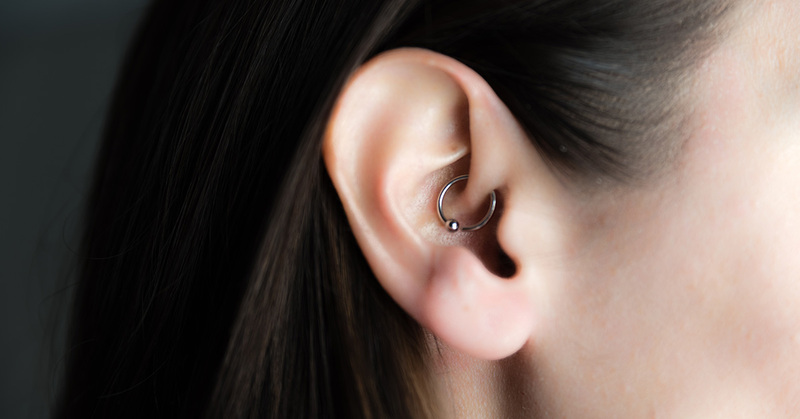 Recently daith piercings have made their way into the mainstream as a potential migraine cure, but what is a daith piercing and how does it work? It is a piercing located in the innermost cartilage fold of the ear, or where the ear cartilage seems to meet the skull. The placement of the piercing is based on acupuncture techniques from TCM. This location is associated with elimination of chronic headaches in general acupuncture treatment, typically in conjunction with other points, but has since become a popular singular point for reduction of migraines or chronic headaches. The exact point of the daith piercing is actually a point that is associated most commonly with digestive help, rather than headaches, but since it is a piece of the larger headache relief puzzle, and has been effective in the past, it has gained more and more popularity. Please note that the side of the head on which the piercing is located may have a significant effect on how well it works. You will want to have the piercing done in the ear that is on the same side of your head that is most commonly in pain during your headaches in order to get the best results from such a piercing. Does Daith Piercing For Migraine Work? One study followed a 54-year-old male who had suffered from debilitating migraines since childhood. It discussed all of the traditional medical interventions he had tried and been prescribed by doctors before he finally tried the daith piercing after doing his own research on possible relief techniques. Although medical interventions in which he participated throughout his life only proved to provide relief for up to a year and for as little as a few weeks at a time, the daith piercing has significantly limited both the frequency and severity of his migraines over a long period of time. The man in this study takes far fewer painkillers monthly as well, and in much smaller doses. This is the piece of the study that researchers found most interesting, as it is more tangible than many pieces of evidence that have come up since the daith piercing has come into the light as a potential migraine cure. This study only follows one man, so, although it is possible that daith piercings would be as effective for others, the study cannot show significant results. The American Migraine Foundation (AMF) doesn’t fully discredit the theory that a daith piercing could help relieve migraines, it does caution patients on the subject. The AMF says that, although there is a pressure point in the region where a daith piercing would go, it would be very difficult for a piercer to connect with the precise location of that point without the guidance of an acupuncturist or general acupuncture knowledge over and above the knowledge of piercings. These cautions issued by the AMF are largely due to the lack of medical research on the subject, so don’t take them as gospel, different treatments may work for different people. Doing your own research on the topic and being prepared for the risks and benefits is your best bet to ensure you are getting relief. The European Accupuncture Council actually accepts the daith piercing and general acupuncture as potential remedies for chronic migraine pain, although they too acknowledge that little more than anecdotal evidence exists on the subject. As with any piercing or body modification, there are risks associated with a daith piercing. First and foremost, the crus of the helix, the area where the piercing will go, takes longer to heal than many other piercings, especially in the ear. You will need to take care of it for much longer than a traditional ear piercing. It takes anywhere from four months to a year to heal this type of piercing, depending on how quickly your body tends to heal overall. You will need to ensure you follow the instructions given by your piercer to the letter in order to keep the piercing clean and assist it in healing. Daith piercings, like all cartilage piercings, are more painful than other piercings and can remain sore for quite some time, although the length of pain will differ from person to person. In addition to the added soreness, cartilage piercings have a higher probability of getting infected than other piercings. Besides the risks, you will likely want to consider a few more things before officially committing to a daith piercing. One such consideration is purely cosmetic: do you like the look of a daith piercing? If you will be constantly bothered by the appearance of the earring, you may want to consider alternative treatments. However, clear earrings, specialized designs, and other options exist to make you more comfortable with the general look of this piercing, so don’t let the look alone be the reason you choose to avoid this type of relief. If you are okay with the look of the daith piercing, next ask yourself if you are prepared to and understand how to clean and care for your new piercing. If you believe you are up for the task, this may be a good move, if not, you may want to once again reconsider. Have you talked to a professional and had all of your questions answered? If not, reach out to a neurologist, and acupuncturist, and a piercer. Make sure the piercer understands the significance of this piercing and how precise it needs to be in order to work well. Maybe ask your acupuncturist to accompany you to your appointment. Finally, once you have considered all of these factors, you should also look into cost and whether or not you can afford this piercing. Insurance will not cover this treatment, as it isn’t studied or considered a medical treatment, so you will need to cover all associated expenses on your own. Although little research exists to prove once and for all whether or not daith piercings work to eliminate migraine pain and pressure, there is plenty of anecdotal evidence out there to encourage sufferers to try this route. Our advice would be to try acupuncture first to ensure you will get some kind of relief from this type of stimulation before committing to a daith piercing. It is also important to do your own research, ask lots of questions, and talk to people who have gotten this piercing on community forums before committing. Getting migraine relief from a simple piercing and avoiding all of the painkillers, meds, and neurologist visits is extremely appealing for people who suffer from chronic migraines. We think it’s a great alternative to more traditional procedures, but everyone is different, and this may not work for everyone. If you follow our advice on things to consider before getting pierced, and take into account the risks, you should be well prepared to make a great decision and help others to make such decisions in the future.